If you’ve been diagnosed with a medical condition with your thyroid, you might be a candidate for thyroid surgery. While surgery is a dramatic option, it is often the most effective one. 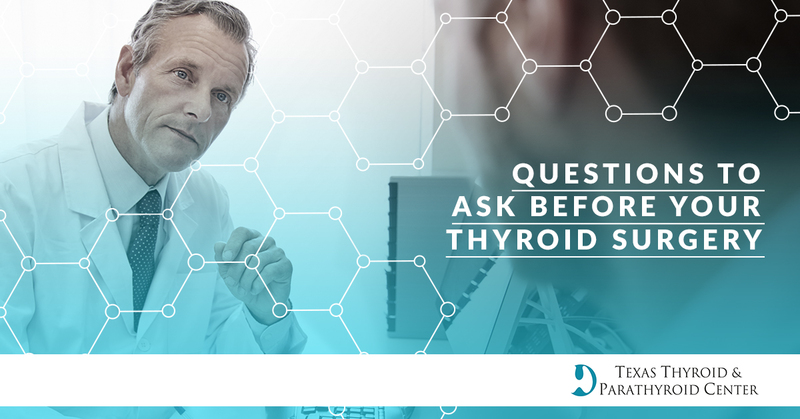 But before you commit to thyroid surgery, there are a few important questions you should ask your general practitioner or endocrinologist. Are There Viable Alternatives To Surgery In My Case? Depending on the severity of the thyroid condition, be it cancer, goiters, or an over or underactive gland, there may be alternative treatments that will keep you from undergoing surgery. In some cases, fine needle aspirations of the thyroid may be effective in treating your condition or alleviating some of the symptoms. Other treatments for benign nodules on the thyroid include ultrasound ablations. All of these options can be performed at the Texas Thyroid & Parathyroid Center in Austin. Thyroid surgery can be carried out in around two hours, meaning that the most skilled and competent surgeons can complete many of these surgeries in their career. Ideally, your surgeon should conduct a minimum of 50 thyroid surgeries per year and has conducted at least 500 in the course of their career. In addition to their personal work, the surgeon should routinely be seeking out additional opportunities for training and continuing education. Dr. Kroker performs hundreds of thyroid surgeries every year and has received advanced training at the Mt. Sinai Hospital at the University of Toronto, a world-renowned thyroid surgical center. Once you’ve elected to undergo surgery and have found a skilled surgeon, it is important to understand how much of the thyroid is being removed. Many surgeries are thyroidectomies, which is the complete removal of the entire gland. In other circumstances, the surgeon may suggest lobectomy, which only removes half of the thyroid. If you have been diagnosed with thyroid cancer, your surgeon may perform lymph node dissections that will remove some of the lymph nodes that surround your thyroid. Based on how intensive your surgery was, and your general health, you can recover from your thyroid surgery as either an outpatient or you may spend a few days in a hospital. While its widely accepted that inpatient recovery is the safer and more effective recovery option, this may not be viable for all patients. If you are considering outpatient recovery, it is important to discuss with your surgeon and endocrinologist how you plan to manage your recovery and how to react to any post-surgery complications like bleeding and infection. Bleeding, feverish temperatures, intense pain. Your voice may sound different or scratchy for a few days after your surgery. This is to be expected and will resolve itself with time. If you experience a tingling or numb sensation in your fingers and mouth, or cramps in your muscles, you may have hypoparathyroidism. Consult your doctor for a plan of action to address this condition. What Follow Up Care Do I Need After My Surgery? Before you even go in for your surgery, it’s important to work with your surgeon or endocrinologist to arrange follow up visits and post-surgery care options. These visits will include the removal of any stitches or staples, and to check on your scarring and the rest of your neck. Your surgeon will also provide insight into when you can resume your regular day-to-day activities like work, exercise, and even driving. It’s important to follow your doctor’s suggestions and not to deviate from their post-surgery care plans. If you have been diagnosed with a condition or illness relating to your thyroid, then it’s time to arrange for a consultation with Austin’s leading Thyroid surgeon. Dr. Teresa Kroeker is an experienced and able surgeon. Her expertise in the endocrine system and in conducting thyroid surgeries makes her a valued part of the medical community. Her commitment to the care and comfort of her patients is evident in all of her work. Contact the Texas Thyroid & Parathyroid Center in Austin today to schedule an appointment.